Millions of Americans are missing one or more of their teeth. Many of them are self-conscious about it, and seldom smile. If you are one of them, a dental implant from Koch Park Dental in Florissant may be just what you’re looking for. Dental implants are titanium posts that are surgically implants into your jaw. An artificial tooth goes on top of the post. Once they are in place, they look and function like natural teeth. Modern implants have been around for about fifty years. They used to be uncommon, but today they are considered part of mainstream dentistry. With today’s digital technology, dental implants can be placed in the patient’s jaw with nearly one hundred percent accuracy. One caveat: you need to have enough bone mass to support the implant. Even if you don’t, there is a solution: bone grafting can give you enough. Most patients who receive a dental implant find that they are stable, and an excellent replacement for their natural tooth. 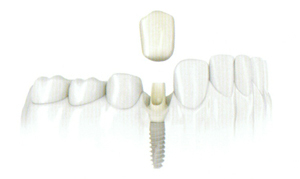 Implants can also be used to anchor dentures. Ask us about All-on-4 Implant Supported dentures. Replacing a missing tooth with a dental implant can transform your life. To find out more, call Koch Park Dental in Florissant. We also provide cosmetic and general dentistry. Schedule a consultation with us today.